Bud and Betty Miller were both born and raised in Texas. Betty accepted the Lord Jesus as her Savior when she was 12 years old in her aunt’s Baptist Church. In 1972, she received the Holy Spirit at a Full Gospel Businessman’s meeting, and her life completely changed. Working as a lab technician, Betty had the opportunity to be around many sick people, and her prayer of faith brought healing to many. People began driving many miles to have her pray for them, and the Lord continued to pour forth His healing miracles and deliverance through Betty, as well as many other gifts of the Spirit. As she began to receive more invitations to minister, Betty quit her job and went full-time into ministry as an evangelist in 1974. In 1977 she met and married R.S. “Bud” Miller, who had recently received the baptism in the Holy Spirit, and together they formed Christ Unlimited Ministries. Bud, with a business background, had started and managed over 32 businesses and now uses his talents in the work of the Lord. He is an encourager with a gift of wisdom that has blessed many. They moved to Prescott, Arizona in 1978 and later pioneered and established a non-denominational Full-Gospel church there, which they pastored for 13 years (Christ Unlimited Fellowship — Dewey, Az.). Five years of that time they developed a local Bible School. Many of their disciples are now active in their own ministry outreaches locally and at large. They have ministered in several African nations as well as India, Nepal and Mexico. Betty is a teacher of the Word of God, with a beautiful ability to present truth in a simple and understandable way. She has authored 21 books plus numerous articles and teachings posted on the BibleResources.org website. She attributes her gift of writing to the Lord. Many times the prophetic gifts of the Holy Spirit will flow through Bud and Betty in the Word of Knowledge and Word of Wisdom bringing encouragement and solutions to the problems in the lives of those present. Through a miraculous event, Betty and Bud were able to obtain the Bible.com website in 1994 and developed it into an Internet ministry that reached 1 to 2 million visitors a month Then in 2012, in their senior years, they have now founded another Bible based website called BibleResources.org and have developed over 10,000 pages of ministry oriented content that has changed the lives of people all over the world. They have served as pastors, teachers, and evangelists, with an apostolic/prophetic calling to proclaim the gospel through the Internet. 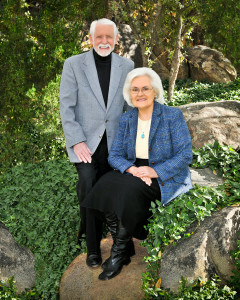 God has used the Millers on the Internet to reach millions of people each month around the world with the Word of God. The new website, BibleResources.org, is devoted to helping people understand and grow in God by providing many Bible resources and tools free. The website offers an enhanced Bible search feature to help the user find what they are looking for in the Bible. The site has audio/video online Overcoming Life teachings, a Prayer Room, Bible Answers, Bible Teachings, Daily Devotionals, a Chapel Bookstore, plus many other Christian mobile apps and resources. God’s Wisdom for Daily Living is also posted online at BibleResources.org for those who enjoy their devotionals on the computer or mobile devices. Bud and Betty continue to share their love of the Lord with all who know them and remain involved in praying for the local area ministries throughout Yavapai County. Bud and Betty credit the Lord for making their lives one of purpose and joy. They live in the mountains of northern Arizona where Betty continues to write and they both reach out over the Internet to the entire world through their video studio.